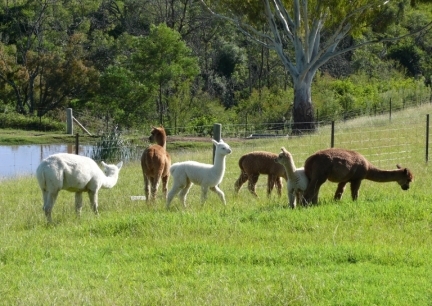 ﻿We started with 3 alpacas in 2004 and have built up to 20 including both Huacaya and Suri. Our original male, Dudley sired by Prestige Valentino produced offspring with fine dense fleeces and good character which are easy to handle. The alpacas are shorn annually in October/November and the fleeces sorted and classed according to micron and handle. Alpacas are members of the camelid family which also includes camels and llamas. Their soft padded feet have a minimal impact on the land avoiding degradation and erosion. Like the goats they are browsers rather than grazers and enjoy a varied diet of grasses and shrubs. They are interesting easily managed animals which are rewarding to keep being very responsive. They live quite happily with the goats and exhibit strong guarding qualities keeping foxes away. They are shorn once per year in the spring and their dry fleece means they do not need crutching and are not susceptible to fly strike. in a wide range of natural colours. Fleeces from our younger animals tend to be finer and softer with a fibre diameter below 20 microns. ﻿The Suris are a more recent addition but already we have some beautiful fleeces from them. Suri fleece is in long curly locks or ringlets which move freely with the animal giving a flowing impression. It is characterised by its lock structure, lustre and handle. Animals are available for sale as breeders (pregnant or ready), guards or pets. White and coloured fleece of both types are available. We prefer to sell whole fleeces but we are prepared to split them if smaller quantities are required. White and light fawn Hucaya and Suri under 20 micron is $60/kg (Currently 17-20 micron).